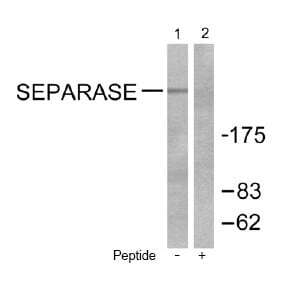 ab52158 detects endogenous levels of total SEPARASE protein. Synthetic non-phosphopeptide derived from human Separase around the phosphorylation site of serine 801 (N-S-S-P-V). Our Abpromise guarantee covers the use of ab52158 in the following tested applications. WB 1/500 - 1/1000. Detects a band of approximately >175 kDa (predicted molecular weight: 233 kDa). Caspase-like protease, which plays a central role in the chromosome segregation by cleaving the SCC1/RAD21 subunit of the cohesin complex at the onset of anaphase. During most of the cell cycle, it is inactivated by different mechanisms. Belongs to the peptidase C50 family. Autocleaves. This function, which is not essential for its protease activity, is unknown. Phosphorylated by CDK1. There are 8 Ser/Thr phosphorylation sites. Among them, Ser-1126 phosphorylation is the major site, which conducts to the enzyme inactivation. 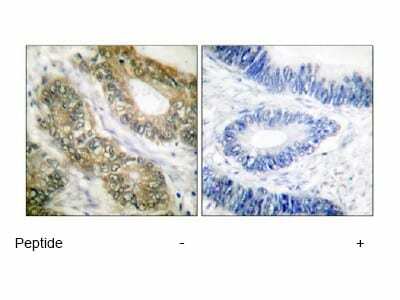 Immunohistochemical analysis of separase expression in paraffin embedded human colon carcinoma tissue using ab52158 (1:50 dilution). Left: sample untreated. Right: sample treated with immunizing peptide (negative control). Publishing research using ab52158? Please let us know so that we can cite the reference in this datasheet. There are currently no Customer reviews or Questions for ab52158.